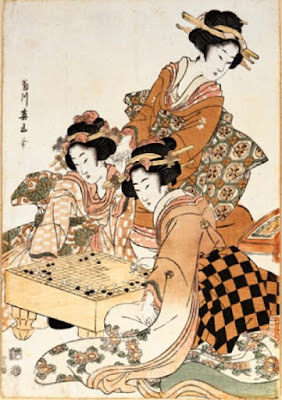 Japanese geisha playing weiqi (go) c. 1800. This post should be considered an extended footnote of my series on what has been written in English about the history of Chinese strategic thought. As I sifted through the materials I needed for that review, I came across one trope about Chinese culture that appears again and again when Westerners try to unearth the secrets of Chinese strategy. It is the idea that the essence of Chinese strategic culture can can be found in the game of weiqi. This contrast is reflected in the respective intellectual games favored by each civilization. China's most enduring game is wei qi (pronounced roughly “way chee.’ and often known in the West by a variation of its Japanese name, go). Wei qi translates as 'a game of surrounding pieces"; it implies a concept of strategic encirclement. The board, a grid of nineteen-by-nineteen lines, begins empty. Each player has 180 pieces, or stones, at his disposal, each of equal value with the others. The players take turns placing stones at any point on the board, building up positions of strength while working to encircle and capture the opponent's stones. Multiple contests take place simultaneously in different regions of the board. The balance of forces shifts incrementally with each move as the players implement strategic plans and react to each other’s initiatives. At the end of a well-played game, the board is filled by partially interlocking areas of strength. The margin of advantage is often slim, and to the untrained eye, the identity of the winner is not always immediately obvious. This sort of reductionism is not unique to Kissinger. In the past few years the readers of the National Interest, the Huffington Post, Bloomberg, Foreign Policy, and the Indian Defense Review have all been told that weiqi is the secret to understanding Chinese foreign policy. The claim has been repeated in mass market paperbacks and in serious academics journals alike. Each of these outlets describes the relationship between Chinese strategic culture and weiqi more or less in the same terms that Kissinger does, complete with the contrast between Chinese weiqi masters and their Chess playing Western counterparts. There is only one problem with all of this: the Chinese play chess too. I don't mean that in the "given that they all learn English in high school, China has the largest English speaking population in the world" sense. I mean in it in the "this has been an integral part of Chinese culture for a millennium" sense. The Chinese have been playing chess since the Song Dynasty, 1,000 years ago. This means chess has been a cultural touchstone in Chinese society for just as long--if not longer--than it has been a played and analyzed by Europeans. 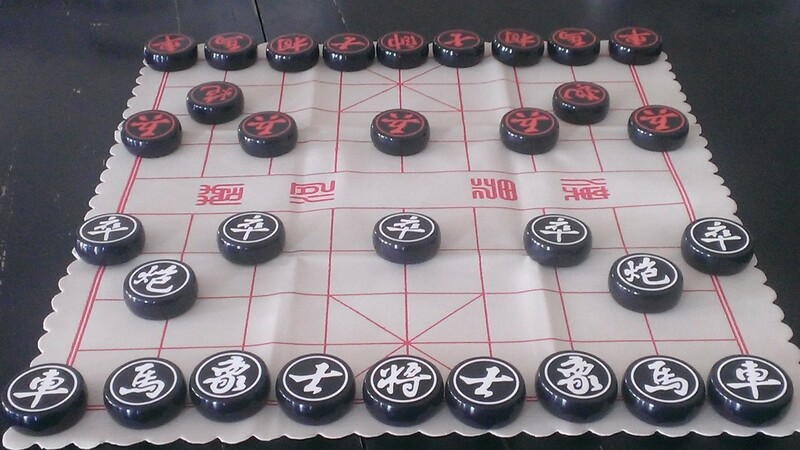 This is a picture of a Chinese chess (xiangqi) board given to me by a friend who lives in Beijing. As you can see, the game has some cosmetic differences from Western chess; the pieces are not carved figurines as is the case in Western and Indian chess variants, but are chips of stone or wood with the character for each figure engraved upon it. In Chinese chess pieces are placed on the intersections of lines, not the squares between them. Some of the pieces have strange names to the Western ear. There is no tower in this game, for the Chinese kept to the original meaning of the Persian word rook (ruhk) by calling the horizontal moving pieces in the corners chariots. Likewise, the diagonal moving pieces flanking the king are not called bishops, as in English, or jesters, as in French, but elephants. Some rule changes are more substantial. A river bisects the Chinese chess board, and only some pieces have the ability to traverse it. The king must remain within a nine point square (his 'fortress') and is protected not by an all-powerful queen, but two body-guards. Chinese pawns can movie sideways but not diagonally, and they receive no promotion for reaching the back rank. Most entertainingly, the Chinese have added a wonderful piece not found in Western chess: the cannon, capable of jumping over other pieces, leaping across the board in one move. Despite these differences, the dynamic of the two games are quite similar. In both pieces are differentiated and ranked. The goal of each game is checkmate, the total victory achieved when the opposing king cannot escape capture. Both have a clear "opening," "middle game", and "end game" stage and the types of moves and priorities associated with each stage of the game are similar. In both Chinese and Western chess the players seek to establish a superior position early in the game, often focused around controlling the center, have a middle game that centers on sacrifices and other forced sequences of moves ("combinations") to create a more favorable balance of power, and an end-game where "zugzwang" impasses are both common and fatal. Both variants are ultimately a contest of elimination, and because destroying high value pieces is so critical to both Chinese and Western chess, in both games great advantage goes to those who hold the initiative. In both, tactical moves like 'forks' and 'skewers' (which force the enemy to choose between the loss of two valuable pieces) are the hallmark of skillful play. Given the descriptions of Western and Chinese approaches to strategy usually bandied about in these discussions, the few meaningful differences between the playing style demanded by Western and Chinese chess games might be surprising. 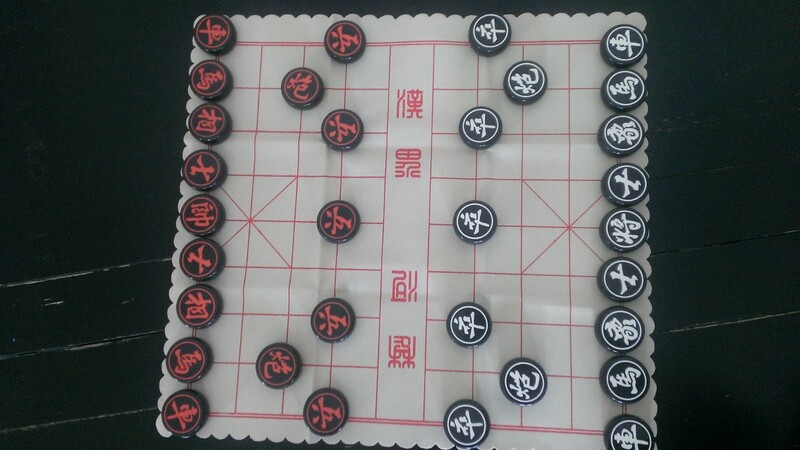 There are less pawns in the Chinese version than in the Western one, and they come already deployed near the center of the board. This means elaborate pawn structures have no place in Chinese chess, and by extension, the "patient accumulation of relative advantage" pawn skeletons represent have no place in it either. It is striking how much faster the game of Chinese chess develops. Unlike in Western chess, where powerful pieces like the rooks and the queen are held in reserve until the middle or (more rarely) the end game, Chinese chess is a race to place the most powerful pieces (the chariots and cannons) in forward positions as quickly as possible. Many talented players judge the strength of their position less on the location of their pieces than on the number of turns it took to get them there. There is a decidedly offensive bias to such a game. Decision is sought early and often. The end game also is shorter and more often decisive: what Westerners call "stalemate" is in Chinese chess a declared a victory for the side that delivers it. In comparison to weiqi, Chinese chess has a less distinguished place in traditional Chinese culture. Weiqi was lauded in the early days of the Warring States by the Confucian scholar Mencius. 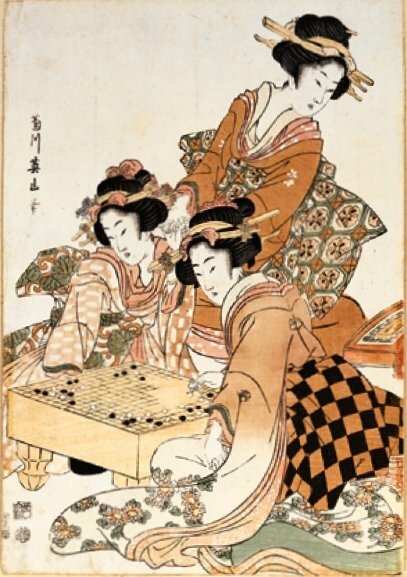 By the 4th century AD the game was being called a "conversation of the hand" (手談) by Chinese intelligentsia. In late imperial times it would be known as a one of the "four cultivated arts" of a Confucian gentleman, a sure marker of gentility and good breeding. It was the kind of thing Confucian scholars and dilettante intellectuals would play between poetry contests and drinking games. Today it is still associated with intelligence, inner cultivation, and upper class refinement. Chinese chess has always had more of a plebian flavor. If the local gentry played weiqi during their social visits, you can be sure old Uncle Zhou down the street was playing chess. The populist trappings of Chinese chess might account for its popularity; if gambling games like mahjong are put to the side, chess is easily the most played board game in China (though if the uber-popular Killers of the Three Kingdom maintains its current market share for another two decades it might be able to displace it). Walk down any public Chinese park and you will pass dozens of chess games being played, each surrounded by a crowd of old men cheering, jeering, and interjecting their preferred move. I've only met a few men in China who don't know how to play Chinese chess; I have had a much more difficult time finding anybody (man or woman) willing to play weiqi. As a friend told me earlier this week when I discussed this with him: "In China all boys play chess. Only the really smart ones care about weiqi." If the defense analyst trying to discern the contours of Chinese strategic culture applied the same essentialist logic to Chinese chess that Kissinger has applied to weiqi, he would conclude that the Chinese think about war and strategy much like Westerners do, except with greater emphasis on bringing over-whelming offensive power to the fore, less focus on elaborate multi-step stratagems or complex formations, and a strong preference for complete and unambiguous victories. He would, in other words, draw a picture of the Chinese strategic tradition exactly opposite to the image presented by those who claim that weiqi holds the secret to Chinese strategy. It is too easy to cherry-pick in opposition. The observer wishing to argue that Chinese strategic thought is obsessed with finding decision in battle, offensive power, and total victory (let's call this hypothesis the Chinese Chess Way of War) need look no further than the most famous military narrative in Chinese history, the Romance of the Three Kingdoms. The enormous popularity of this Ming Dynasty epic novel and the stories associated with it are not unlike that of Chinese chess--you must work very hard to find any man or woman, be they poor or rich, who can't relate in detail the stories and exploits of the Three Kingdoms heroes, despite the low status fiction has held for most of Chinese history. Contrary to Kissinger's claim that the Chinese tradition places "subtlety" above "feats of heroism," this is a novel that celebrates little else. Its pages are full of physical feats and clashes of individual heroes and villains of the sort we Westerners associate with Greek epics like the Iliad. Its center-point is the Battle of Red Cliffs, a clash of arms that terms like "decisive battle" were invented to describe. It concludes with the destruction or submission of every warring kingdom to the new Jin Dynasty--what we moderns might call "regime change." The vision of victory idealized in the book is a total and absolute one. I would not underestimate the impact of this book on Chinese--indeed, all of East Asian--popular culture. Despite the number of "Sunzi for businessmen" books out on the market, I have never personally met anyone from Asia who claims that the strategies of the Sunzi have helped them succeed in business or life pursuits. I have, however, listened to a friend discourse on how all of the principles he uses in management were modeled on the leadership of Liu Bei, protagonist of the Romance of the Three Kingdoms. Three Kingdoms is influential, and I am ready to argue that it has had as large an impact on Chinese attitudes towards war as any book written in Chinese. What I am not ready to claim is that it contains the essence of Chinese strategic and political thought. Whether or not there is an enduring Chinese Way of War is an empirical question. We can only know the answer to that question by analyzing dozens--perhaps hundreds--of wars and operations from across Chinese history to see if patterns arise. Until such a study has been completed, I think it is wisest to table attempts to find any True Chinese Way of War. China is a civilization. What is more, it is a civilization with 3,000 years of recorded history. Over that time thousands of Chinese generals have warred, hundreds of emperors have ruled, and dozens of thinkers have written about strategy and war. Drawing from this heritage to justify one's opinions about modern China is a lot like citing verses from the Bible: if you look hard enough you can find anything in there. It is better to recognize that the Chinese strategic tradition has within it many different voices and lessons, some in sharp contradiction with each other. It is up to individual Chinese leaders to decide what in this tradition is useful to them. This does not mean attempts to understand Chinese strategic thinking in terms of weiqi are useless. They can be quite useful. David Lai's essay on weiqi and Chinese strategy argues that a weiqi game is a good way for Westerners to understand the rather difficult Chinese concept of "strategic efficacy," (shi 勢), and with this I agree. Garet Olberding recently suggested that the terms used in medieval weiqi manuals can help us understand what these same terms meant when they were used in rather terse campaign narratives found in the histories of the Tang and Five Dynasty periods. I think this is brilliant. Attempts like these to use weiqi to help Westerners understand Chinese concepts and language are excellent. It is when analysts move past this, contending that weiqi contains the essence of Chinese strategic thought or is the secret to Chinese foreign policy, that these arguments go awry. This isn't how the real world works. History and politics will never be as simple as a game of chess--or weiqi. T. Greer, "The Chinese Strategic Tradition: A Research Program (I)," The Scholar's Stage (23 May 2015), and "The Chinese Strategic Tradition: A Research Program (II)," The Scholar's Stage (26 May 2015). Henry Kissinger, On China (New York, Penguin Books, 2012), 22. Ibid. 23-24. Incidentally, Kissinger is incorrect. There is a third option, known as stalemate, where the losing side is able to maneuver themselves into a position where there are no legal moves available to them, forcing a draw. Discerning the connections between this ability to stave off certain defeat with legal technicalities and Western strategic culture is an exercise I will reserve to the reader. Alexander Vuving, "China's Grand Strategy Challenge: Creating Its Own Islands in the South China Sea," National Interest (8 December 2014); "Points of Control: China's Weiqi Strategy in the South China Sea," Indo-Pacific Review (15 November 2015); David Gosset, "Weiqi vs Chess," Huffington Post (3 April 2015); Keith Johnson, "China's Oil Rig Gambit," Foreign Policy (9 May 2014); Henry Sanderson and Indira Lakshmanan, "China Adopts Board game Strategy to Blunt U.S. Pivot to Asia," Bloomberg (9 December 2013); Ranjit Ral, "China's String of Pearls--Is Male Next?" Indian Defense Review (24 July 2013). Michael Pillsbury, The Hundred Year Marathon: China's Secret Strategy to Replace America as the Global Hegemon (New York: Henry Holt and Co., 2015); Anna Samson, "The Grand Weiqi Board: Reconsidering China's Role in Africa," Security Challenges 7, No. 1 (Autumn 2011), 61—78. David Lai, Learning From the Stones: A Go Approach to Mastering China's Strategic Concept, Shi (Carslise Barracks, PA: Strategic Studies Institute, 2004). Garet Olberding, "Dynamic Divisions: The Tactics of Weiqi 圍棋 and Strategic Space in Imperial China,” Journal of Chinese Military History , no 2 (Dec. 2014), 91-139. See pp. 92-95 for a fair critique of the forced style of weiqi reductionism discussed here, which among other targets, calls out Kissinger by name. Do you know The Protracted Game: A Wei-Ch'i Interpretation of Maoist Revolutionary Strategy by Scott Boorman? It might be good for a footnote. I have seen the book referenced in the literature Charles, but I have not been able to pick it up myself. As the Amazon link shows, it is quite expensive. I read this because someone posted this link on reddit. As a Chess, weiqi, and Chinese chess player, I am surprised by the high quality of this article. Also I fully agree with the conclusion. 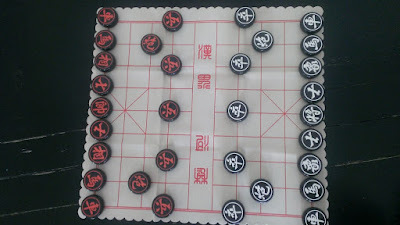 Chinese chess, Xiangqi, is somewhat "compatible" with Chess. You learn the position of pieces etc from one game and the experience you gained is indirectly applicable to the other game to a certain extend. I also agree that the best Xiangqi game will create long-lasting impression of surprise. I also want to add that Japan has another chess called Shogi. People say the different type of chess reflect the underlying rules of how politics work in each country. Maybe they use the game to model real world relationships. I disagree with quite a lot about this article not because I disagree with the fact that everyone in China plays xiangqi, but the conclusion that the article gives. As Mr. Greer himself states, only the really smart kids care about weiqi as well as the fact that weiqi has a much higher cultural status than xiangqi. If we go by this logic, this would mean that the people actually seeking to rule China *will care about weiqi more than they care about xiangqi". If a measurement of being a learned Confucian gentlemen is to master the four arts, then anyone who seeks a higher social status would *have to know weiqi*, even superficially. I know for a fact all rich Chinese parents get their kids to learn weiqi from a very young age (and not just rich Chinese parents, all parents try to get their kids to learn weiqi). Thus, people who wants to be thought of as cultured will also try to emulate the philosophy of weiqi even at a very superficial level. But this still matters. We know that Confucian scholar bureaucrats were in power for a large part of Chinese dynastic history. These people *definitely* care about weiqi even if they only have a very shallow understanding of it for the sake of social status signalling purposes. Therefore, I don't think Kissinger is too wrong in putting an importance on weiqi. If you need to master weiqi in order to become a Confucian gentleman which allows you to gain social status that helps you in your career as a bureaucrat, then weiqi, and the philosophy behind it, must have some influence on the thoughts of the bureaucrats, which might very well have *some* influence on the governance of China. We can also see that this belief in weiqi as some mystical game/philosophy in the Chinese psych due to how pop culture represents it. Mr. Greer talks about the Romance of the Three Kingdoms. There's a reason Guan Yu was playing weiqi and not xiangqi during his surgery. In the same sense, there's a reason why all Chinese tv shows and movies (no matter how crappy) will have the emperor, the generals, the ministers playing weiqi instead of xiangqi. 1. " I know for a fact all rich Chinese parents get their kids to learn weiqi from a very young age (and not just rich Chinese parents, all parents try to get their kids to learn weiqi)." Then Anon, your facts are wrong. At sundry times and places I have tutored, befriended, and lived with China's wealthy and affluent. Almost none of them know how to play the game. This is not really a new thing. A scholar contacted me after I published this piece last year with a fun nugget: of the original 10 great marshals, only 3 ever learned to play! "If you need to master weiqi in order to become a Confucian gentleman which allows you to gain social status that helps you in your career as a bureaucrat, then weiqi, and the philosophy behind it, must have some influence on the thoughts of the bureaucrats, which might very well have *some* influence on the governance of China." The problem of course is that you don't need to be a Confucian gentleman to gain social status in today's China (and even in imperial times, the military hierarchy had a different system of advancement). Learning how to play weiqi does not help a contemporary official, nor a contemporary PLA officer, one whit.
" Thus, people who wants to be thought of as cultured will also try to emulate the philosophy of weiqi even at a very superficial leve"
But how is something only understood at a superficial level supposed to define and restrict policy making at the highest level? What else could we extend this argument to? The Chinese elite force many more of their children to practice piano, violin, and guzheng than they force to play weiqi--are we ready to say that the secret to Chinese political culture is found in the notes of a piano solo? The Chinese elite all buy iPhones--is the secret to Chinese strategy to be found in the IoS user interface?